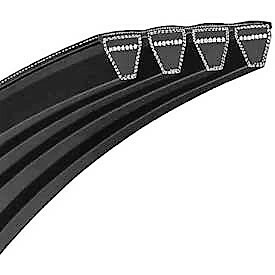 Continental ContiTech 5VF, 8VF Torque Team Plus® Banded V-Belts formally Goodyear EP tension members are aramid cable cords. They are twisted from aramid fiber, which is five times stronger than steel, then are treated for adhesion, improved flex life and increased resistance to shrinkage. Torque Team Plus® belts exhibit only one-half of the initial elongation of other belts and maintain greater dimensional stability over the life of the belt. They stand up to higher horsepower, high-tension drive requirements, shock loads and abusive installations better then standard joined belts, multiple V-belt teams or chain and sprocket drives. See our pulley section for 5V or 8V Section QD Bushing Type Pulleys and if you have any question Contact Us.